One of the biggest problems both new and experienced players face is running out of mana. Worse still, the reasons why aren’t always evident which means it can be hard to correct. Improving your mana management is one of the number one ways to improve as a healer and you’ll notice your numbers skyrocket if you manage it correctly. We’re going to look at how efficient each of our spells are so we know which ones to cast more and which to cast less (because none of the tooltips make it at all obvious) and we’ll look at the power of the mana restoring trinkets and azerite traits. By the end of the article you’ll have a direct list of work-ons that you can apply to your next raid. We’re going into detail but every section will have a quick version too for those skimming. Cast Wild Growth and Cenarion Ward on cooldown whenever there is damage. Keep Efflorescence down, and Lifebloom up. Only cast Regrowth with Abundance or a clearcasting proc. We judge the efficiency of a spell by how much healing you get for the mana you spent. Spells like Wild Growth and Efflorescence are quite expensive per cast but they give you so much healing that they’re worth every mana that you spend on them. Regrowth on the other hand is cheaper than either of them but you get so little comparative healing that it’s a bad cast. 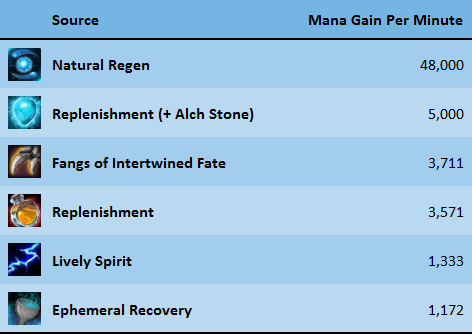 Mana efficiency is actually the metric that is most important to us in raid. Our only resources are mana and global cooldowns and we’re tuned to have far more global cooldowns than mana so how we spend it is ultra important. Let’s compare the HPM (Healing per mana) of our different spells. Azerite Traits and your individual stat lines will change these a little but take the same core points from it regardless. Wild Growth, Efflo and Cenarion Ward are our most mana efficient spells. We want to cast them as often as we can and they’re so far ahead that we don’t care if they overheal a little, or if there aren’t always three people standing in Efflorescence. Let fantastic tools like this Weak Aura remind you as they come off cooldown. Make sure you’re spending your Omen of Clarity procs. Check you’re doing it right by running a log through wowanalyzer.com. It’ll tell you how many you missed and make a point of improving that number pull-to-pull, raid night to raid night. Flourish, Tranquility and Tree of Life are all ultra high throughput, low mana healing that you need to be casting as often as possible. Plan out your usages before the fight even begins. Make the most of Flourish by ramping into it with rejuvs and Wild Growth . Make the most of Tree of Life by filling it with Rejuv and Wild Growth casts instead of wasting it with Regrowth. Maximize your innervate value by fitting an Efflo and Wild Growth cast into the duration. A significant portion of your healing in almost every raid fight will come from smart usage of your cooldowns. You would have to cast 15-20 rejuvs to cover the healing a single Tranquility can do (and it’ll cost you 10 times as much mana). We can talk about how to get maximum value from each of them but the key here is first to get as many of them into every fight as possible. Write down a list of times at the beginning of each fight. Talk them through with your healing officer. Tree of Life is a fantastic mana saving cooldown. Your spell priority in Tree of Life is Efflorescence > Wild Growth > Rejuvenation. Rejuv gets a huge efficiency boost from Tree and you absolutely shouldn’t spend any global cooldowns on Regrowth. You’ll probably want to keep Lifebloom active for the tank healing but it’s a much lower priority than normal. This doesn’t quite tell the full story because Wild Growth auto-targets low health allies and applies several times as many Mastery stacks as Rejuv but the table should illustrate how strong Tree of Life is while also showcasing why Regrowth is a terrible idea. Remember to keep Efflorescence down because as high as these numbers are it still dwarfs them. The Lively Spirit azerite trait and Alchemist Stone trinket are both really strong as are Fangs of Intertwined Essence. Aim for a high item level version of each. Potion of Replenishment is much better than a Coastal Mana Potion and you should aim to pop one on every single fight. These compete well with other trinkets and traits and you realistically always want to be wearing Alch Stone + a Lively Spirit trait. An Alch Stone / Fangs combo is also fantastic if you’re really struggling. Make sure you are tracking Innervate / Fangs on your UI. There’s nothing worse than missing free casts because you didn’t know they were back up already. Aim to cast your first Innervate at around 85,000 mana. Ok ok this one doesn’t need a short and long version. It’s quite common to cast Rejuv as your “nothing is happening but I feel like I should be doing something” button. Perhaps a quarter of the raid is at about 80% so you’ll slap a rejuv on them all while you wait for the next mechanic to hit. Two seconds later a monk hits them with a Vivify and your rejuv goes straight to overheal. It’s understandable to feel like you should be doing something with every second and you should – but it doesn’t have to be rejuv, or a healing spell at all. Start including Solar Wrath in your rotation during downtime. The damage is valuable, it’ll fill gaps in your rotation and it’s completely free. You aren’t throwing rejuvs out to spot heal the raid, you’re doing it because you know a big mechanic is coming up and you’re about to give them a giant green buffer. Every time you cast rejuv try and assign it to a specific mechanic in your head. “I’m casting this in preparation for the Blast Off in six seconds”. Cast more Wild Growth. Keep Efflo down, and Lifebloom up. Try and fit as many of your incredibly mana efficient cooldowns into each fight as you can. Use a Potion of Replenishment every fight and pick up a Lively Spirit if you can. Consider the good mana regen trinkets like Fangs and Alchemist Stone. Don’t overwrite your rejuvs. Cast them before big damage is due, not just to fill button presses. Use Solar Wrath during downtime. Try and match your mana to the bosses health. The article was written with a stat line of 9100 buffed intellect, 12% Haste, 20% Crit, 15% Mastery and 5% Versatility. Your own stats would change the numbers however never by enough to change your spell priorities. I think the conversation for mana conversation doesn’t take into consideration the complexity of Abundance and Regrowth with Rampant Growth. There’s a conversation that needs to be had about how all top parsing Druids are using Abundance and their third highest healing spell is Regrowth. Cheers. This coming Tuesdays article is for all healers and then I’ve got some Mistweaver specific stuff on its way too.